The Ride to Wounded Knee | A Song for the Horse Nation - October 29, 2011 through January 7, 2013 - The National Museum of the American Indian - Washington, D.C.
On December 29, 1890, the Seventh Cavalry massacred Miniconjou Lakota leader Big Foot and 150 of his people at Wounded Knee, South Dakota. In the days leading up to the massacre, Big Foot and his followers rode 300 miles, hoping to find refuge at the Pine Ridge Reservation. 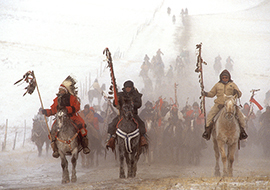 In 1986 two Lakota elders—Curtis Kills Ree and Birgil Kills Straight—established the Sitanka Wokiksuye (Big Foot Memorial Ride), tracing Big Foot’s route to Wounded Knee. The journey was the beginning of a long-awaited healing process. In 1992 the event was revived under the name Oomaka Tokatakiya (Future Generations Ride). While it still pays homage to Big Foot and his followers, today’s ride is meant to foster leadership qualities in youth. During the two-week, 300-mile journey, riders experience some of the hardships their ancestors endured, as a physical, spiritual, and intellectual remembrance. As individuals and as a nation we have been spiritually crippled, because, after the massacre at Wounded Knee, our ancestors had never gone through the process, the ritual that is usually accorded to… people who… lose a loved one. And until… that takes place, they are in a period of mourning. The Centennial Ride to Wounded Knee, December 29, 1990. Photograph by James Cook.